New research, published this week, has provided scientists with greater insight into the climatic changes happening in the upper atmosphere. Scientists found that changes in the Earth's magnetic field are more relevant for climatic changes in the upper atmosphere (about 100-500 km above the surface) than previously thought. Understanding the cause of long-term change in this area helps scientists to predict what will happen in the future. This has key implications for life back on earth. A good understanding of the long-term behaviour of the upper atmosphere is essential; it affects a lot of satellite-based technology, such as global navigation systems and high-frequency radio communication systems. Some satellites even operate within the upper atmosphere itself. The increase in atmospheric CO2 concentration has been thought to be the main cause of climatic changes at these high altitudes. This study suggests that magnetic field changes that have taken place over the past century are as important. Both increasing levels of CO2 and changes in the Earth's magnetic field affect the upper atmosphere, including its charged portion, also known as the ionosphere. Dr. Ingrid Cnossen from the British Antarctic Survey used computer simulations to compare the effects of these two factors over the past century. While CO2 causes heat to be trapped in the lower atmosphere, it actually cools the upper atmosphere. The simulations show that the increase in CO2 concentration over the past 100 years has caused the upper atmosphere, at around 300 km altitude, to cool by around 8 degrees. At the same altitude, changes in the Earth's magnetic field caused a similar amount of cooling over parts of North America, but caused a warming over other parts of the world, with the strongest warming, of up to 12 degrees, located over Antarctica. Dr. Ingrid Cnossen said: "Computer simulations are a very important tool in understanding the causes of climate change at high altitudes. We still can't explain all of the long-term trends that have been observed, but it helps that we now know how important the magnetic field is." The new simulations also indicate that rising CO2 levels have caused the densest part of the ionosphere to lower by about 5 km globally. Changes in the Earth's magnetic field can cause much larger changes, but they are very dependent on location and can be either positive or negative; over the southern Atlantic Ocean a decrease in height of up to 50 km was found, while an increase in height of up to 20 km was found over western Africa. The findings are published in the Journal of Space Weather and Space Climate. The new simulations also indicate that rising CO2 levels have caused the densest part of the ionosphere to lower by about 5 km globally. 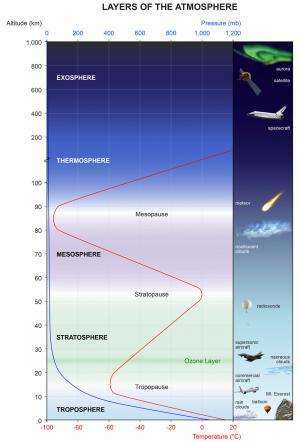 So now CO2 is responsible for the height of the ionosphere? Moronic! Changes in the Earth-Sun connection are responsible for changes in the magnetic field, not plant food. shows that there are far larger forces involved than the piddling effect of CO2 in the atmosphere. The fact that rising CO2 levels FOLLOWS the warming trends historically is completely ignored by the AGWite trolls. "The connection between thunderstorms and plasma bands in the ionosphere at first seemed unlikely"
Oddly the Electric Universe assumes this connection based upon laboratory experiment. "To get an idea of what might be happening, Immel and his UC Berkeley colleagues modeled the atmospheric tides using a computer simulation"
Computer games, awesome! The irony is some call EU pseudoscience when in fact, first and foremost laboratory experimentation is the foundation. "We now know that accurate predictions of ionospheric disturbances have to incorporate this effect from tropical weather." Cart in front of the horse, the electric currents flowing around the earth feed these hot spots. "North America is in one of these sectors"
Aha --it's all due the Electric Universe of Miraculous Plasma, just like everything else --including your (tinfoil)hat size. It's too much to ask, I know, that you understand the intimate relation between temp and density in atmospheric gases, However, and quite simply, net trapping of heat ln the lower atmosphere leads to reduced heating higher in the atmosphere, resulting in colder, denser, upper heights, ie, compression/"subsidence" of air column due to influence of gravity. In this case, specifically, about 5km of vertical extent. Since you missed your mark right out of the gate, I won't even bother to take a crack at the rest of your EU/P rhapsodizing. It's pretty hard to score a win when you are down at the outset. Yep, that's the theory that was held before this discovery, and oddly did not predict this observation. It's ironic your comment about miraculous plasma in light of the claims about CO2 above. At least plasma makes up 99.999% of the universe, CO2 is what, .004% of the atmosphere. Oops, sorry. An honest mistake. .04%. If only I would have left the percentage sign off, .004 would have been accurate. Wrong again. 4 hundredths of a percent(004%) does not equal 4 thousandths(,004). "Wrong again. 4 hundredths of a percent(004%) does not equal 4 thousandths(,004)." I think you meant 0.04% and not 004% however. Doesn't .04% equal .0004, anymore? Damn cellphone posts on the run.